Below Richard gives us a ‘brief’ history of St.Leonard. If you’d like to find out more about the church and its history, please visit his blog. However, recent evidence has come to light showing that the chapel existed in 1215, and if as seems likely, it gave its name to the forest rather than vice-versa, had been founded by c.1208. It survived until the mid-16th century, when it was dissolved shortly before 1547 by the Duke of Norfolk. It was not a chapel-of-ease, for the incumbent of Beeding apparently had no jurisdiction over it; instead, it was described as a free-chapel or chantry belonging to the successive lords of St Leonard’s Forest, the Braoses, the Mowbrays, and the Howards, who presented its chaplains. At the Crawley Exhibition, in 1865, a venerable old key was shown, said to have belonged to the chapel in the forest. No trace has survived of the building. The site is supposed to have been in an enclosure of about one acre, some two miles outside Horsham, sited either on what became the bay of Hawkin’s pond, or not far from the parish boundary near the Horsham-Colgate road leading to Pease Pottage. Horsham abounds with references to St Leonard, his name being given to the Church, road, forest, and pub. But who was he? A straynge and monstrous serpent lately discovered and yet living, to the great annoyance and divers slaughters both of men and cattell, by his strong and violent poison” and in which the creature is described: “This monster was above 9 feet long, shaped lyke an axel tree, with bunches at his side like footballs, which they feared might turn to wynges; he castes his venom 4 rods, and his principal foode is the rabbits of a neighbouring warrenne. St Leonard’s Forest belonged to the great family of De Braose and the Dukes of Norfolk, who succeeded them, but, upon reverting to the Crown, had for more than 200 years been held by several owners. The principal avenue was called Mike Mill’s Race, who, for a wager, undertook a race against the Devil, and fell dead there in the moment of victory. However, the most picturesque legend which lingers around the forest is one postulated by Dr Andrew Borde, who wrote in the 16th Century, saying of the nightingale, “The bird wyl syng round about the forest, but never within the precinct of the forest’. 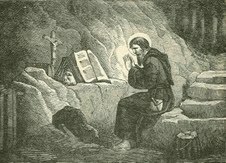 This is because they once disturbed the devotions of St Leonard, who cursed them. Many years ago a biography of “St Leonard of Sussex” by A C Crookshank, was published by Arthur H Stockwell of Ludgate Hill. According to this account our saint was born in 1046 at Chidham in Sussex to Cobnor, a son of King Canute, and a British woman named Una, although Leonard was kept in ignorance of his ancestry for the first ten years of his life and for a time lived as a swine-herd in the forest. Cobnor’s mother was a Saxon wife of Canute, Aelgifu, sister of Werna, priest of Worth. (Later, the king was persuaded to marry Emma, widow of King Aethelred.) It was Werna who told Leonard the secret of his ancestry, for St Leonard’s parents had both died during his infancy and Cobnor had committed him into the care of Werna. It was Leonard, we read, who was responsible for rebuilding in stone the then wooden church at Worth. He discovered an old Roman quarry near Worth which provided the stone, and the building work was financed by the sale of St Leonard’s lands in Chidham. What is undeniable, is the fact that Worth at the time of Domesday was hardly a village, a few houses only, yet the imposing church there (St Nicholas) was erected in a different style to other Sussex churches. The DB entry reads: “There is a villain with half a plough. In the time of King Edward it was worth 30 shillings, and afterwards 2 shillings, now (in 1086) 20 shillings.” The question arises, and there is no answer, why was so fine and large a church built in so small and unimportant place? Hardly to meet the needs of one villain and his family. Worth was part of the king’s Demesne lands, an outlier of the manor of Cherchefelle, and here we do have the suggestion of a direct link between Leonard and his grandfather King Canute, whom Edward the Confessor had succeeded. is not the wish, the father to the thought? As a postscript it may be added that at Warninglid there is a place-sign which depicts a very un-priestlike Viking warrior with a spear below which appear the words “Werna Gelad”, obviously an attempt to explain the etymology of Warninglid, Werna or Wearda being the name of the warrior (a hypocoristic form of Weardbeorht) and Gelad meaning path. Whether this is explanation any more reliable than the story of the priest at Worth is open to speculation.